Agenda Setting Through Photos: Will the Real Michael Brown Please Stand Up? Note: This blog post is not meant to pass judgment on the events that took place in Ferguson, but is rather a mass communication analysis of the responses from both mainstream and social medias. Death is always tragic, and this post is not meant to downplay the loss of life. 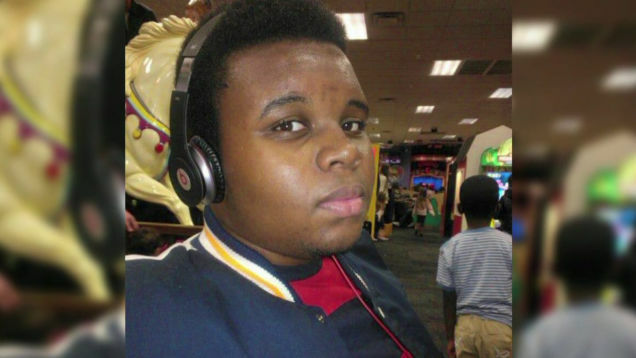 On August 9, Michael Brown was shot in Ferguson, Missouri by a police officer. This just about ends the list of things that everyone can agree on. There have been many conflicting reports about the circumstances of the shooting, and as a result, the public has been subject to many different interpretations by the mainstream media. With regard to communications, agenda setting refers to the ability of the media to shape what people talk about and value as important by devoting space/time to certain stories; a second tenet of the theory is that the press does not necessarily reflect reality accurately. And what about images? 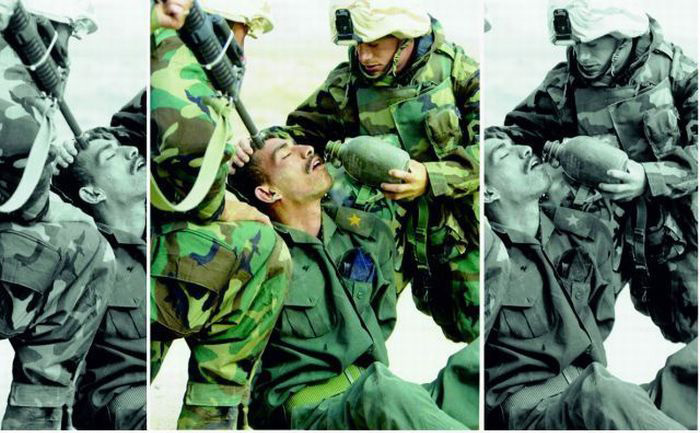 It’s been long since established that images are more persuasive than text in the context of news. And while undoctored photos cannot lie, they most certainly can be misleading. The pictures shown in news reports can have a significant impact on how the viewing audience consumes the content of the stories. 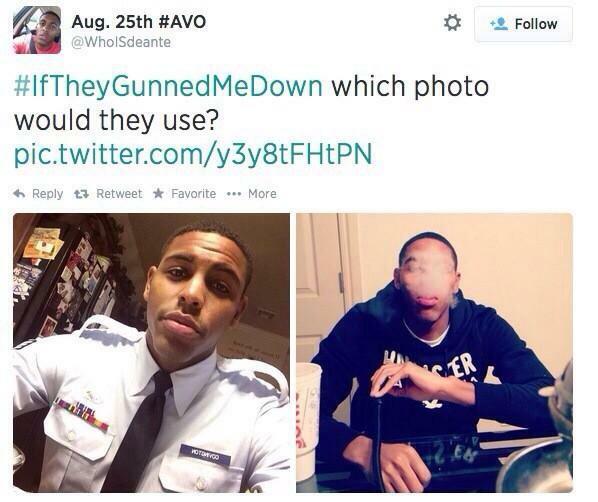 In response, Twitter users began utilizing the hashtag #iftheygunnedmedown to express their dissatisfaction with how the media negatively portrays black men. Some also likened it to the coverage of another black teenager who was recently killed. 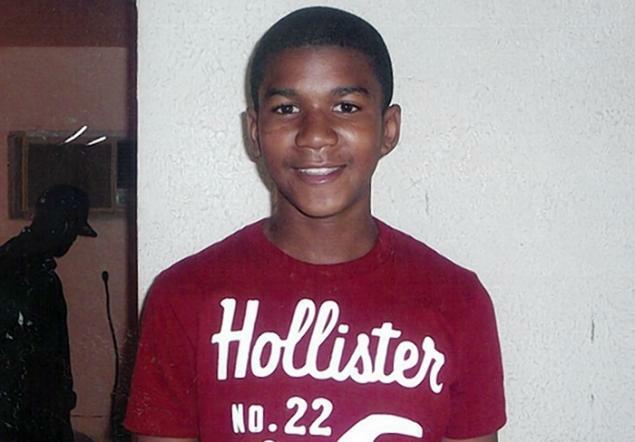 In 2012, Trayvon Martin was shot by George Zimmerman in Florida. As a result of the 24-hour news cycle, we all became painfully aware of the “Stand-Your-Ground” law, and were exposed to many photos of Martin that were less than flattering; this included photos of him flipping the bird and smoking marijuana. While the joke itself was pretty cringeworthy, he did have a point. Anyone who had even watched a single news report about the Martin/Zimmerman altercation already had their understanding of the events shaped by the media. But was this photo any more accurate? The photo was also not that recent (dated January 2013 according to his Facebook). The photo that the media originally showed (of Brown throwing up a peace sign) was actually his default/public Facebook photo (as of July 8). Occam’s razor would posit that the media ran with the “peace sign” photo because they didn’t bother doing further research (and if we wish to be more raffish, we can also invoke Hanlon’s razor). Perhaps it was a kneejerk reaction to call the use of that photo racist? The iffy timing and the horrible damage control by the Ferguson Police Department notwithstanding, this set of images definitely tells a much different story. In this footage, Brown is an imposing 6-foot-4, 295-pound man, and not an innocent child. If this image of Brown were also presented with the original news coverage, how would public opinion differ? Would that have quelled the accusations of discrimination? Would it have prevented riots? At the end of the day, journalism should be about reporting truth. So which image is a more accurate depiction of Michael Brown? As is typically the case when extremes are involved, the truth is probably somewhere in the middle. 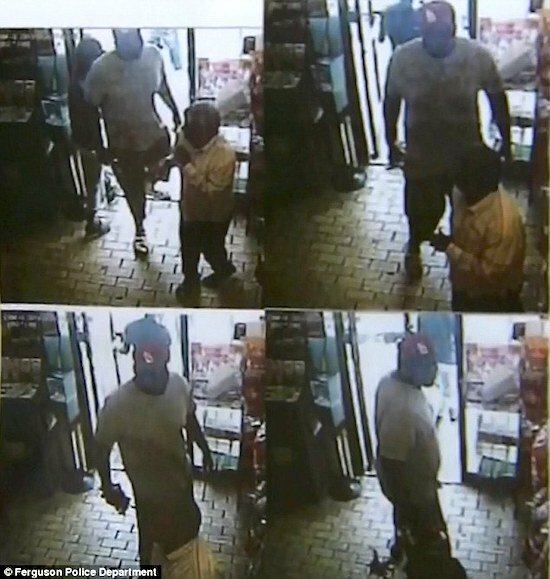 Maybe #iftheygunnedmedown is actually presenting a false dichotomy; Michael Brown could have simultaneously been the recent high school graduate and the man who robbed a convenience store. As consumers of the news, we have a responsibility to be more critical of what’s presented to us. In real life, narratives are not as cut and dry as they are in cartoons. Or on CNN.